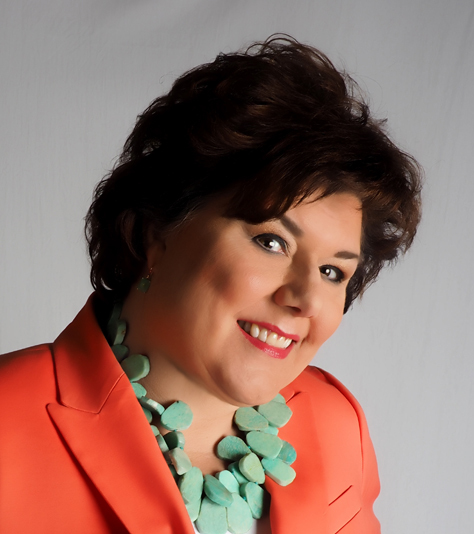 Making my family feel special on Thanksgiving Day makes me feel good! 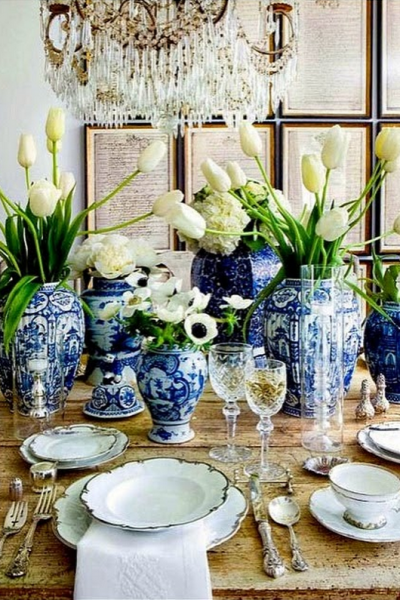 Having a warm & inviting table sets the mood for a day full of good food and fellowship. I have more dishes than I know what to do with! 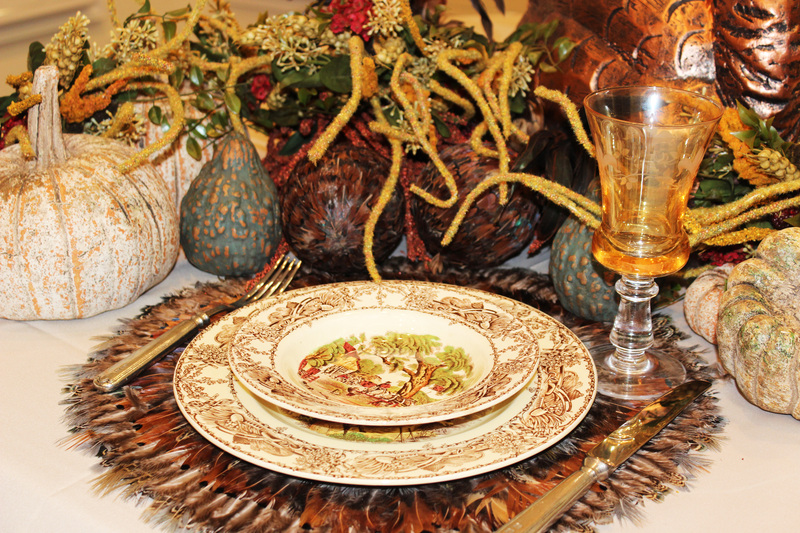 Instead of using my formal china on Thanksgiving, its fun to set the table with my casual themed place settings. For the place setting, I start with tablecloth and/or placement, charger, dinner plate, salad plate, napkin with napkin holder, and silverware. 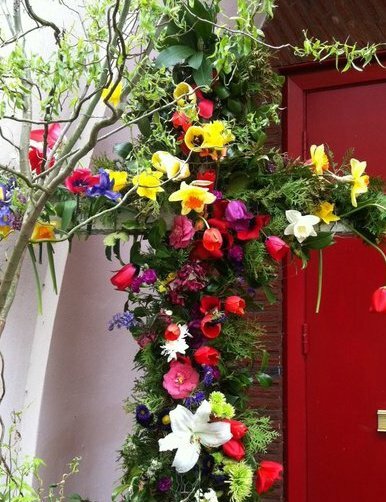 My centerpieces are a surprise each year! 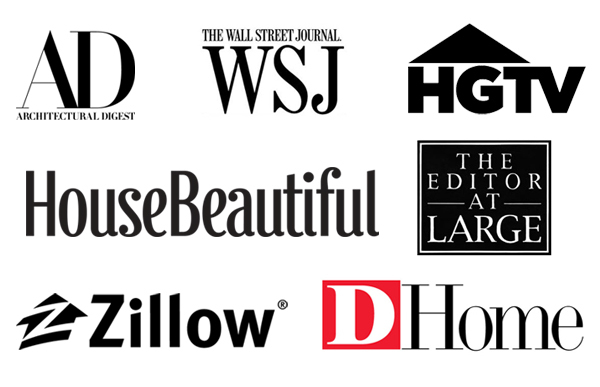 No two are the same and I use everything from burlap to feathers. 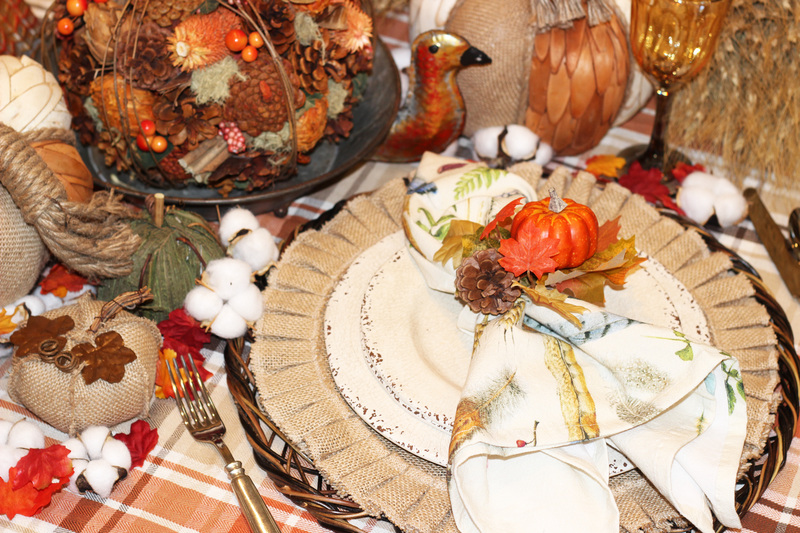 Read about our top 3 tips for creating memorable Thanksgiving Tablescapes here. My best friend lived in Louisiana for several years and it was there that she first tasted fried turkey. Since then, fried turkey has become a tradition for them on Thanksgiving Day. Inject the turkey all over - in the thighs, legs, wings, breasts - you will see some of the marinade squirt out. Inject at different depths in all parts of the turkey. Rub the Cajun spice on the skin and sprinkle in the cavity. Place turkey in the turkey bag and let it sit over night. To fry the turkey in an electric fryer - follow the instructions that come with that fryer. To fry in propane: place the turkey in the pot and fill with water (before you've injected it) so it covers the turkey completely. 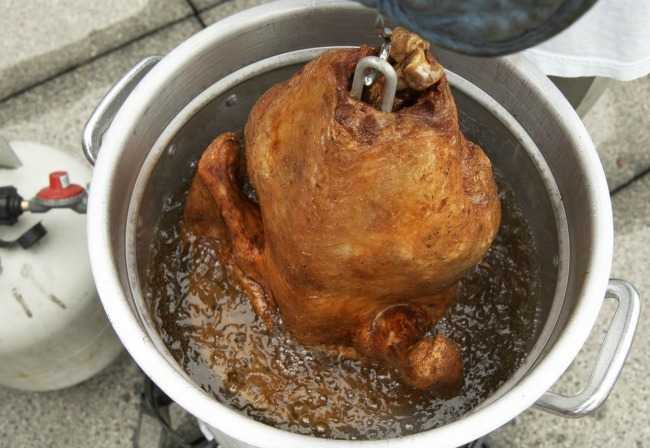 Remove the turkey and then mark the water level - you will then fill the pot to this level with peanut oil. That will prevent the pot from overflow when cooking. Place the turkey legs up into the oil. The temperature of the oil will decrease so you will need to increase the flame until the temperature stabilizes at 375 degrees. Cook the turkey about 3-4 minutes per pound or until the breast reaches 180 degrees. 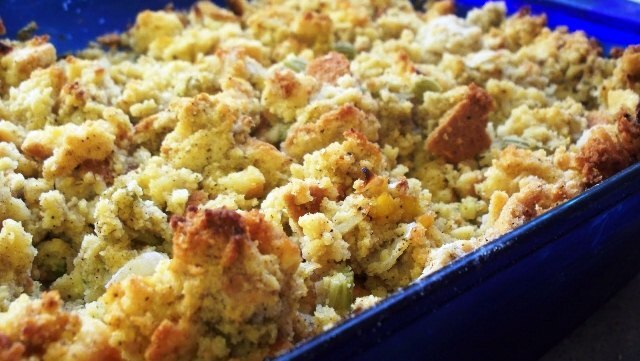 A popular way to prepare stuffing is to use the Pepperidge Farm Herb Seasoned Stuffing Mix. I mix the traditional & cornbread together. Follow the directions on the back of the package and you can’t miss. Broccoli & cheese are made for each other! This yummy combination of broccoli, cheese & rice is scrumptious and is a great choice for your Thanksgiving Day menu. I recommend having at least one dish that isn’t baked! I love this frozen cranberry fruit salad, both refreshing and like a dessert. 3, Pour into 9 x 9 dish & put in freeze overnight. Instead of serving a traditional sweet potato casserole – try this souped-up hash brown potato recipe. Full of flavor and very satisfying. Thaw potatoes (press out all moisture). Mix together sour cream, soup, 1/2 stick butter, salt, minced onion, & cheese. Bake in preheated 350 degree oven. for 60 minutes. Last 10 minutes top with mixture of corn flakes mixed with 1/2 stick butter. Can be made ahead. Bring to room temperature before baking. 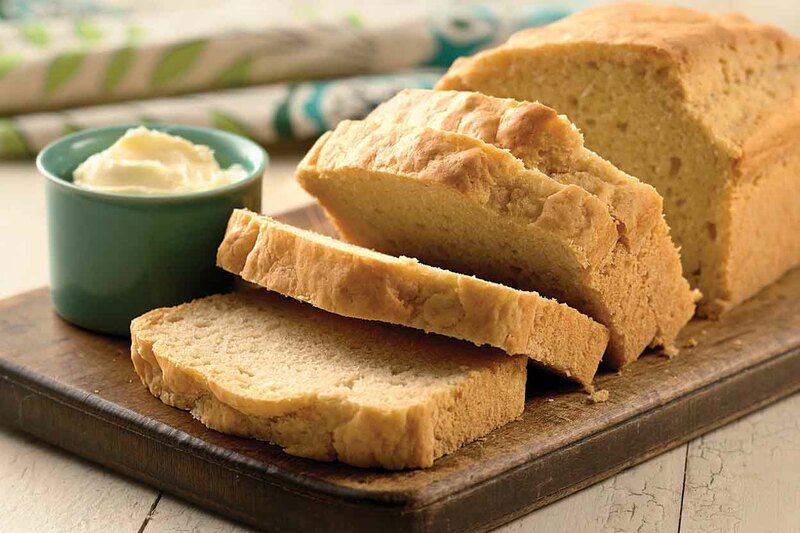 This bread makes a dense, flavorful loaf of bread in the blink of an eye! You will be glad you tried it. For a softer crust add butter into the batter instead of pouring it over the top. 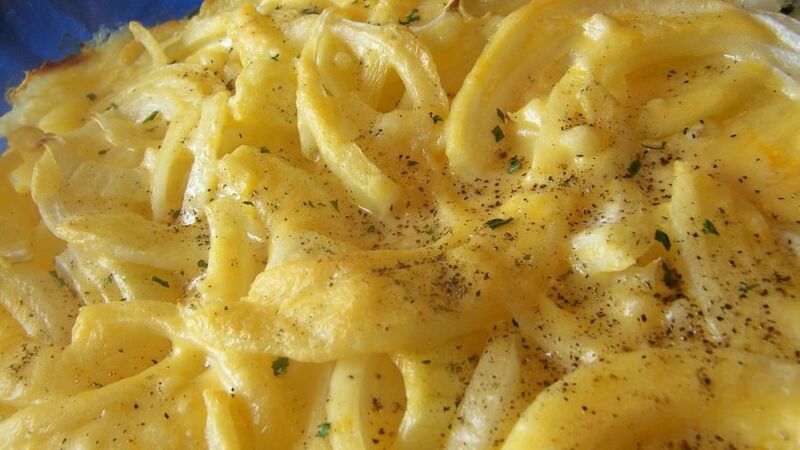 Rich and creamy – a twist on an old classic! 1. Combine gingersnap crumbs, graham cracker crumbs, sugar, butter and pinch of salt in medium size bowl. Press into a 9-inch springform pan. Chill for 30 minutes. 2. Beat the cream cheese until light and fluffy, about 2-3 minutes. Add the cinnamon, pumpkin pie spice, salt, vanilla extract, powdered sugar and pumpkin. Beat until smooth, about 2 minutes. Using a large spatula, fold in the whipped cream, , then pour into the chilled crust, smoothing it into an even layer. Place in the refrigerator and chill for a least 2 hours before serving. Remove the sides and garnish with additional whipped cream if desired. 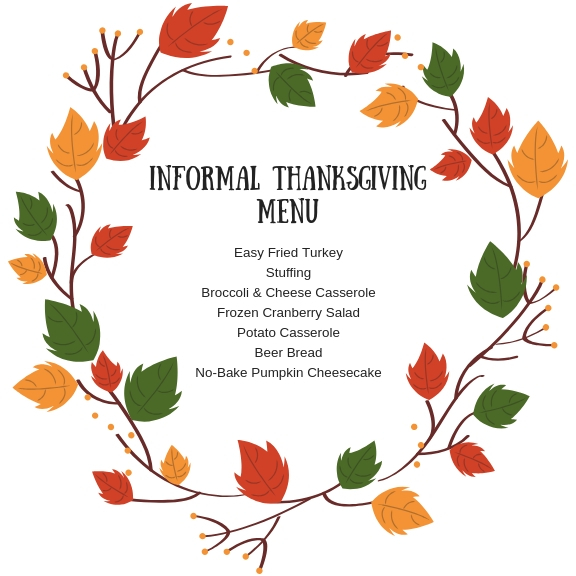 When we travel, have a large number of guests, or events like a new baby in the household, I’ve found a way to serve a fuss-free Thanksgiving meal and set a pretty table! 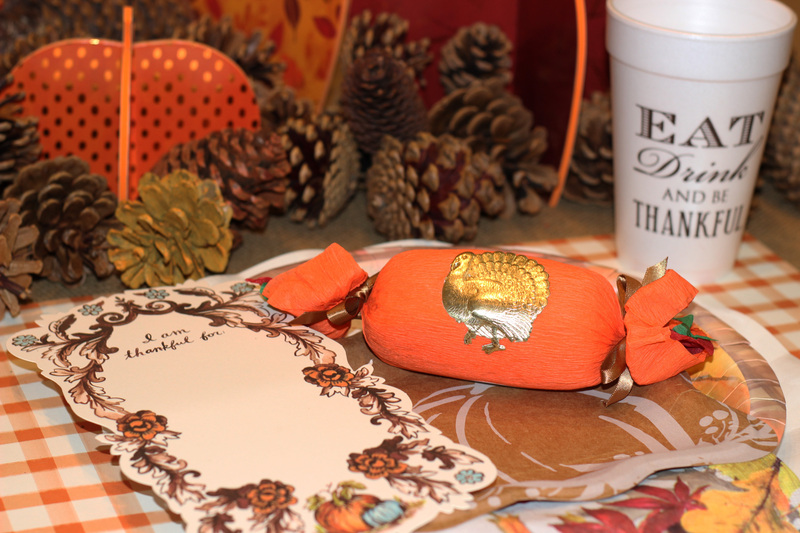 You can easily keep the feeling of a special occasion with all the Thanksgiving paper products available. 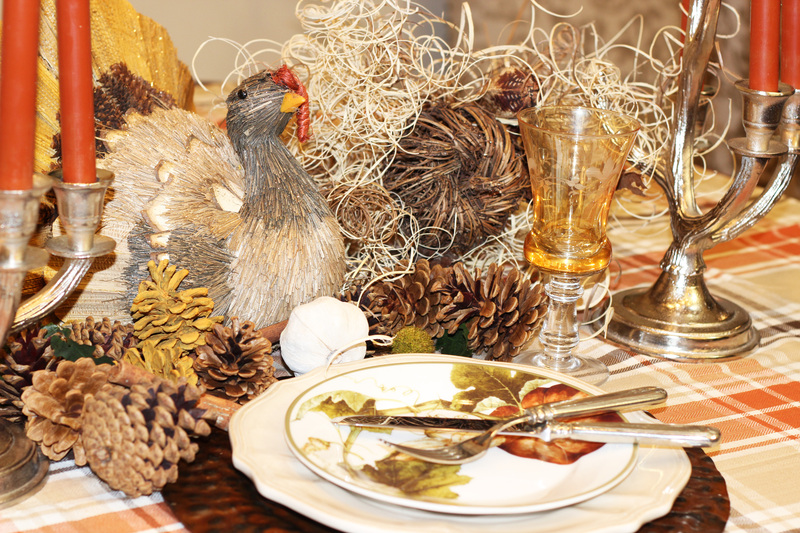 Mix and match patterns, add some pinecones, and you’re family and guests will be impressed! 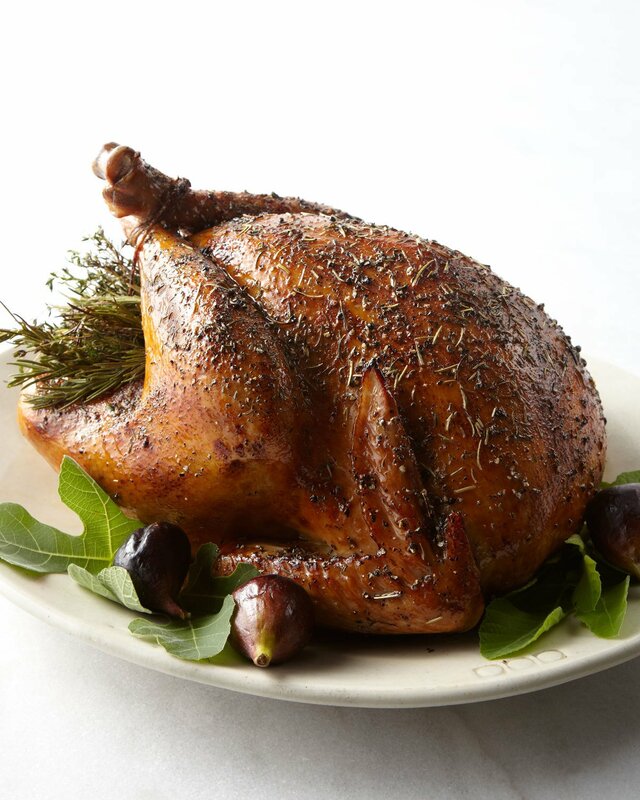 Neiman Marcus has a fully cooked, herb roasted, frozen turkey – just defrost and bake. If you’re traveling, you can throw it in your car and let it defrost on the drive! Or have it shipped to your destination. 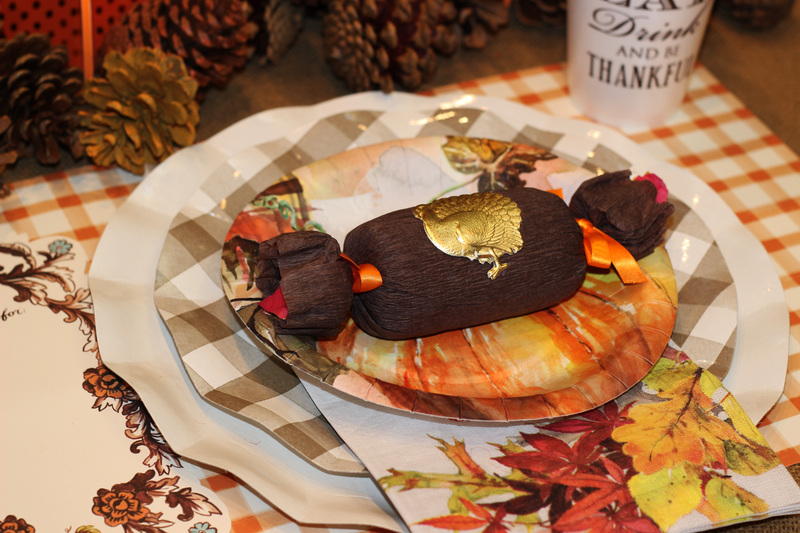 Thanksgiving wouldn’t be the same without stuffing on the table! 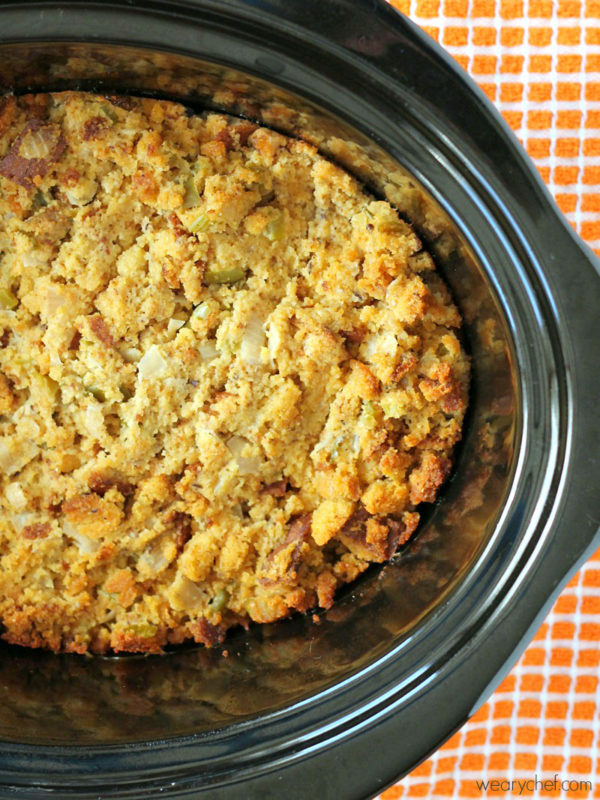 Easy to travel with crock pot stuffing can be made ahead and put in refrigerator. 1. Heat butter over medium heat until melted. Stir in poultry seasoning, black pepper and salt to taste. Add celery & onions and cook until softenend (don't brown). Cool completely. 2. Place bread cubes in a large bowl. Add cooled celery and onion mixture, parsley and fresh herbs if using. 3. Add chicken broth a little bit at a time just to moisten and gently stir. Your may not need all of the broth. Sir in eggs. 4. Cover and refrigerate overnight if making ahead of time. 5. 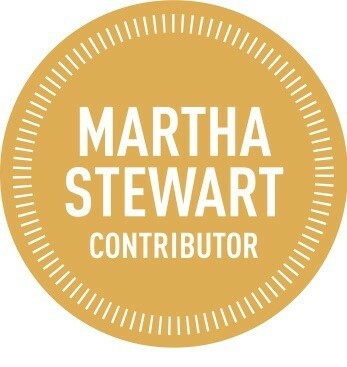 Grease a 5-6 qt slow cooker well. Place stuffing in the slow cooker and turn onto high for 30 minutes. Reduce termperature to low and cook an additional 3-4 hours or until hot and cooked through. If stuffing is done before your meal is ready it can remain on warm. Can use store bought bread cubes/crumbs, which will need closer to 3 cups broth. You can’t go wrong with the green bean casserole that has been around forever. 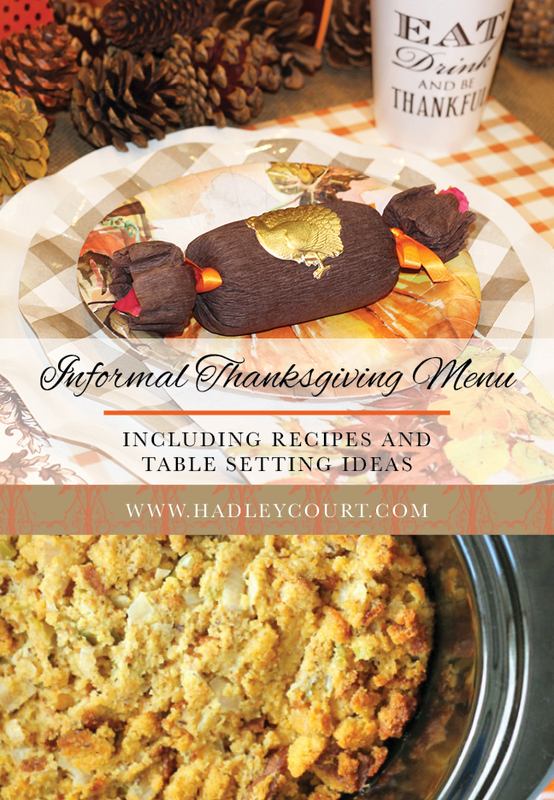 A recipe served on generations of Thanksgiving tables, it is so simple to make. Baking all your recipes in aluminum serving pans makes clean-up even less time consuming! Works perfectly for a buffet style meal. 1. Stir the soup, mild, soy sauce, black pepper, beans and 2/3 cup onions in a 1 1/2 qt casserole. 2. Bake at 350 for 25 minutes or until the bean mixture is hot and bubbling. Stir the bean mixture. Sprinke with remaining onions. 3. Bake for 5 minutes or until the onions are golden brown. 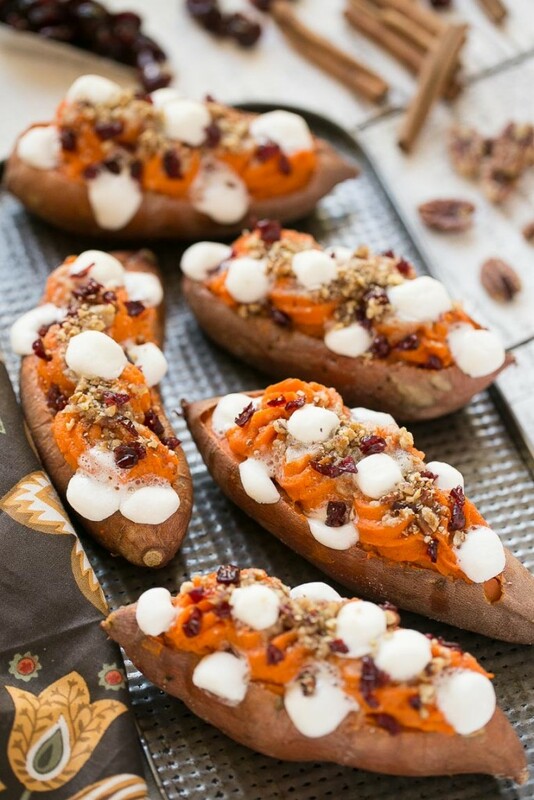 Twice baked sweet potatoes are simple & sweet. Scrub potatoes and bake at 425 degrees for 40 minutes or until soft. Cut slice from top of each. Scoop out inside, being careful not to break shell. Mash the potatoes in a mixing bowl. Add butter, brown sugar, salt and pepper and enough hot mile to moisten. Beat with electric mixer until fluffy. Fold in chopped nuts and pile mixture lightly into potato shells. Garnish with walnut halves. Bake at 350 degrees for 15 to 20 minutes. Top with marshmellows the last 5 minutes of baking until browned and hot throughout. Serving a green salad would be a nice addition to this meal and the easiest thing to do would be to buy a bagged salad to serve. But, if you have time, the wilted lettuce salad is a good option for those short on time and still homemade. 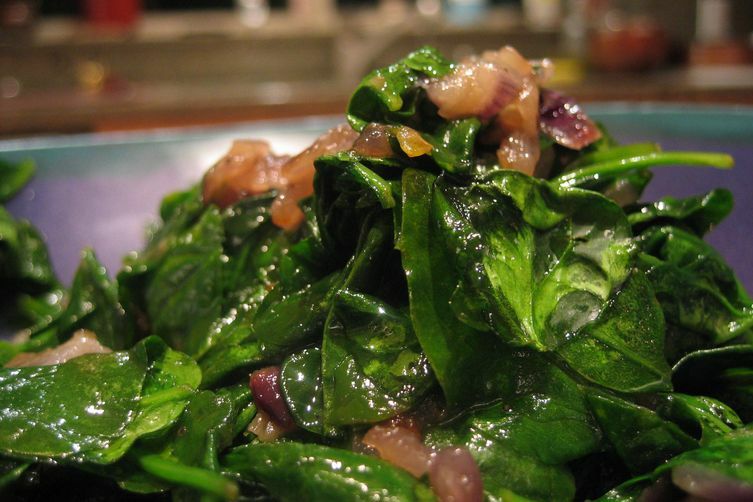 Use some spinach leaves and it can double as a vegetable. Place bacon in a large, deep skillet. Cook over medium high heat until evenly browned. Remove from skillet, crumble, set aside. To the hot bacon drippings, add the vinegar, lemon juice, sugar and pepper Stir over medium heat until hot. In a large bowl, combine the lettuce and green onion. Add the warm dressing and toss to evenly coat. Sprinkle with bacon and serve. 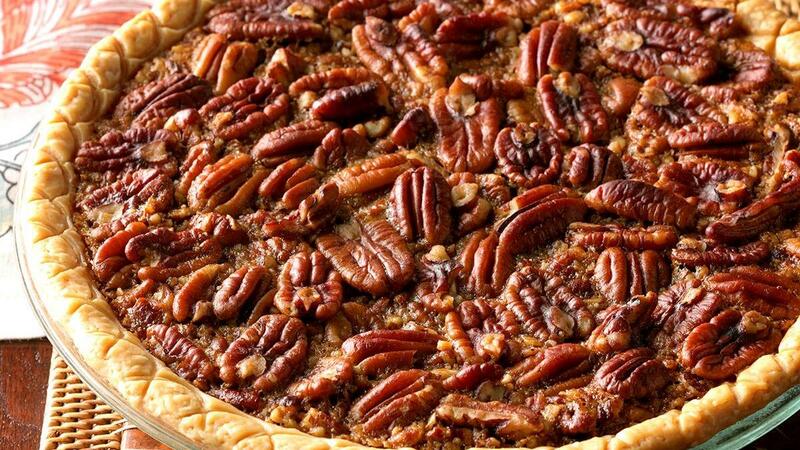 Most Southern homes will have at least one pecan pie ready to serve on Thanksgiving Day. 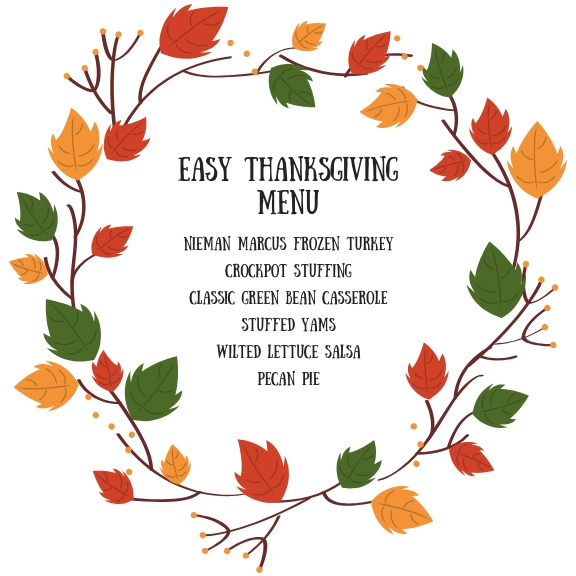 You can whip it up faster than you can say “Thanksgiving”! 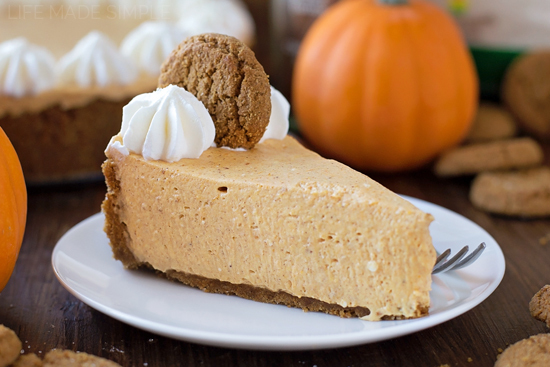 If you are strapped for time, try Mrs. Smith’s frozen pumpkin pie or Costco’s pumpkin pie, both are pretty close to the real thing!